My daughter's warm reception to an offer of knitwear sent me into a frenzy of spinning last week. 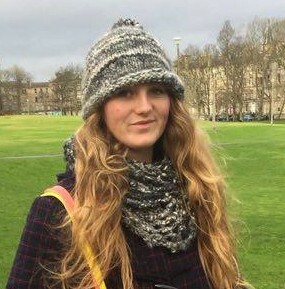 As my companion, Elinor Gotland, remarked, cold weather in Scotland had clearly enhanced the appeal of a woolly hat. The last one I made was crocheted in Black Welsh Mountain sheepswool - frankly unappealing, far too itchy, far too brown. Since himself was going away up to Edinburgh at the weekend, no time for another failure, nor anything too clever, this hat had to be quick to spin and easy to knit. up more tightly against the drag of denim jeans, I could create something nearer to a puni which held the circled fibres better for spinning a semi-woollen yarn. The spinning went really fast on the 10:1 wheel ratio and though the twist and ply looked moderately firm, the yarn was quite fluffy. While washing, I dared a hot to cold plunge and a short thwacking of the skeins to felt the strands for extra integrity. Bit risky with alpaca, but I think I got away with it. Another time, I'd be more generous with the colour, as a fair amount of rainbow just got hidden inside the spinning. Twist three strands of your yarn together and pick a knitting needle size that looks about the same width as the twist of yarn. Knit a square in stocking stitch, write down how many stitches you cast on and how many rows you knitted, draw round the square on a piece of paper, then wash it the same way you intend to wash the hat - for me, that is usually a machine wash on the wool cycle, though I did handwash this alpaca. Reshape while damp, dry flat on a towel. Put your tension square back on the piece of paper, inside the shape you drew before and see how much it has shrunk in length - this varies madly in my experience, from no change at all to 15% shorter. Lay a ruler on the square of knitting and count how many stiches in a row fall within 10cm width. If you can measure the head of the person who will be wearing the hat, run a tape round the widest part from the base of the skull circling the brow, so a custom fit can be calculated. 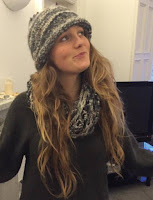 Knitted fabric is stretchy, to end up snug, an adult hat size can be about 5cm smaller than the head it needs to fit. I forgot that in my hurry, so my daughter's hat turned out on the large side, but knitwear is forgiving and so is she. This yarn was bulky, using 6mm needles, the tension came out about 10 stitches to 10cm. To fit a 56cm head, I cast on 55 stitches (should have been 50, really) using a stretchy, long tail cast on, using a 50cm long circular needle. Joining to work in the round, it is always a fiddle to make sure there is no twist in the cast on row, but once you have got the first round done, knitting round after round is the easiest, quickest knitting there is. Stocking stitch will naturally curl up on itself. 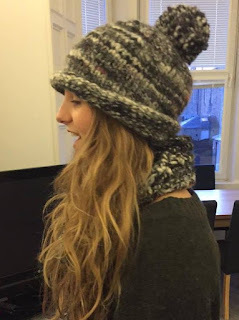 As you knit the tube, allow the work to curl up into the width of hat brim you want, then carry on knitting til the length from the fold at the bottom of the brim equals the distance from your earhole to the point on the side of your head where the skull slopes in steeply toward the crown. If your tension gauge shrank in the wash, carry on knitting til the work is proportionately longer. Shaping the crown to match the shape of a head, strictly speaking, the gradient gets steeper the nearer you get to the top. There are lots of methods for making neat reduction patterns, but in principle, you just need to reduce the diameter roughly 4 - 5 stitches every row. In a finer wool, this might work best reducing 8 or 10 stitches in one round then knitting a plain round or two before reducing again. Keeping it simple, in bulky wool, knit round reducing your total stitch count to a multiple of 5 by knitting two together here and there. Since I started with 55 stitches, easy peasy, just place a stitch marker every 11 stitches. Every time you reach a marker, knit two together. As the diameter gets smaller, it gets harder to use the circular needle cord smoothly, so I switch to using magic loop. Once there are only two stitches between each marker, break the yarn, put the tail on a darning needle and thread it through the stitch loops, taking off the markers. Pull tight and fasten off. This is the first pompom I have made in ages. Yarn marketed as sock wool generally contains nylon. I believe the nylon is added to increase durability and never mind its sweaty side effects. Madness. Of all life's little luxuries, warm, dry, comfy feet rank very highly with me and having lived in Wellies for months, I'd say nothing beats 100% wool, except, of course, 100% alpaca. I met some alpaca lately and noticed their fleece seemed to be standing up ok to the wet and muddy conditions. In my grand January exacavation of stashed fibres, I rediscovered these black and white alpaca tops from John Arbon. Spun worsted straight off the end of the strip with a decent amount of twist, even pure alpaca yarn ought to be reasonably durable. John Arbon sells fantastic socks and though the ones without nylon are marketed as bedsocks, my husband had a pair he wore all day. They haven't worn out, but since an accidental hot machine wash, I now wear them. Feeling guilty about this, I knitted him another pair, taking care to be generous with the size, in case of future shrinkage. After all the coarse, bulky stuff I've been churning out lately, it was a great pleasure to be spinning double knitting weight with luxury fibre, though of course, knitting the finer yarn into socks has been comparatively time consuming. My companion, Elinor Gotland, gave himself John Arbon alpaca socks for Christmas. When I came in to the kitchen after a long cold morning out on a friend's farm, finding her giving both pairs a hoof wash in the sink was disquieting on a number of counts. "Steve said that my hand knit socks felt amazingly light and warm." "After seeing you fiddle about turning heels, missing all the subtitles on your French telly series, he's hardly going to point out they're a bit loose, Beaut. Actually, they feel quite flimsy to me. I don't suppose they'll last." I sat down heavily and eased off my Wellington boots. "I suppose you think I should have bought some nylon riddled sock yarn?" the pot. How did scanning the Speckled Face Beulahs go?" "Oh excellent, only three were empty out of 95 ewes, mostly they are expecting twins with 14 sets of triplets." "I'll bet Mary was pleased with that, especially after the trouble they had with those two new rams escaping. Must have had plenty of energy left." Elinor laughed her raunchiest laugh. She made quite a play of stripping off her rubber gloves while I drank my tea. Still, credit where it's due, she's being remarkably helpful. I hate hand washing. "Thanks for doing those socks. I might knit myself a pair, ready for lambing in March." "I'd think about blending in some long wool if you must use alpaca. Strong, fine wool fibres might be as tough as nylon and less cheesey feet." "Adding in some Gotland fleece, you mean?" "Or Wensleydale. Better still, knit yourself some proper sheepswool boot socks." "Oo, I know I've got some woolen spun Beulah stashed somewhere. If only I could remember where I put it." I first made this bag using yarn spun by a friend of a friend, from the fleece of her sheep up in Swansea. Doesn't look much, but the qualities of handspun wool and the colours it turned during my early plant dye experiments strongly appealed to me. Though most of the colour has long ago faded and the handles have stretched, it is still in everyday use. To my mind, that bag launched my present life and it has certainly survived a thousand trips. Making another from recycled balls of heavy superbulky yarn from the Huxtable jumper was a way of keeping my own first handspun wool in use and hopefully, creating a better advert for my new status as sole trader of Rich & Strange Silk and Wool Work. Crocheted up by eye, more by luck than judgement, this shape of bag in durable wool has turned out highly functional. With the handles over one shoulder, it tucks comfortably under the elbow, as shown in this photo of one I made for my friend BG. When in a crowd, I bring mine forward, so the purse and phone pockets sit securely against the side of my waist. Packed with shopping, it is remarkably capacious and sturdy enough to carry pints of milk and bags of potatoes. Once full, I just hold the two handles in my hand and let the weight of the bag hang down. The one below, which I made for my sister, in Herdwick wool, shows the basic bowl shape. Having just made two more, this time, I have written out the pattern. This simple pattern is easy to adapt to any thickness of yarn and hook size, just make sure it is a good strong, dense yarn, as smooshy merino puff won't last long in service. My tension came out at 10 dc stitches and 11 rows to 10cm squared. Every round hereafter should begin with a chain stitch, into which you place a crochet stitch marker (such as a safety pin). Close each round with a slip stitch into this marked stitch, which also counts as the first dc of each round. For the next eight rounds, there is no further increase as the sides of the bag go straight up. Add more rounds for a deeper bag. To draw the top edge of the bag gently inward, on the next round, decrease three stitches, evenly spaced around the circumference like round 17 in reverse, then crochet a plain round, reduce three more stitches like round 16 in reverse, then crochet a plain round, reduce three more stitches like round 15 in reverse and finish with two plain rounds. Break off yarn leaving a metre long end to sew the edge. You can use the front or the backs of the stitches showing at the outside of the bag, as you prefer. If using the neater front as the outside, roll the top round of stitches outward and sew them against the round below to create a rounded edge. The bag handles are formed from one length of crocheted cord. There are lots of options for making a cord, I think this spiral is the simplest. Make a starting loop and chain 5 stitches, slip stitch into the first stitch to join. Make one dc into each of the five chain stitches and carry on puting a dc into the outer thread of each dc stitch, round and round, endlessly spiralling upwards. For this bag, 170cm cord made my preferred size, pin your cord onto your bag and judge your handle length for yourself. Place one end of the cord at the centre of the base. Using the aran yarn and the 3mm crochet hook, push the hook through any loop on the cord, then through the front of a stitch on the bag and draw up a loop of aran yarn to the surface, keeping the other end of this yarn held hidden underneath the handle. This will leave a chain of aran loops visible along each side of the cord, it's a fiddle at first, keep the loops large, it goes quicker once you have the hang of it. Work along one side of the cord to the top edge of the bag, across the width of the cord and down the other side, back to the centre of the base of bag. Now place the other end of the handle at the centre point and crochet that against the opposite half to make one straight line. Hold the bag up by this long single loop and find the middle. With the bag upside down, pin the midpoint of the handle to the centre of the base of the bag, so that there is a handle loop on either side. Crochet on the cord to make a cross shape at right angles. Now double crochet oblong shapes to make pockets the size of your purse and your phone and sew them inside the bag, between the handles on opposite sides. Putting the bag through a 40 degree cotton wash cycle in the machine will felt it a little and even it out a lot. The two bags in the photo show how the crocheted wool looks before and after the wash. While it is damp, stuff the bag firmly with rolled towels to establish a nice round shape while it dries. I have called my new bag Macduff, since its mid brown yarn was untimely ripp'd from a barely worn Jacob X Texel jumper with the dark brown yarn also ripp'd from another misguided project, a Black Welsh Mountain woolen hat that itched. My Macduff came with me to the bank to discuss setting up a business account and its partner is now up for sale at Crafts by the Sea. My friend BG uses wool to make art. In her eyes, kempy old sheepswool locks and matted beige bits from dodgy plant dye experiments are just inspiring raw materials, which saves me grieving over foolish purchases and failures and generally makes for a happy symbiosis. Nonetheless, for Christmas 2014, I was sure her life would be enhanced by possession of a spinning wheel, if only I could find the right one, at the right price. BG's ideal wheel would definitely need to cope with big art yarn and minimal maintenance, so when a friend of ours pointed me towards this Ashford Mark 1 Country Spinner on eBay, I zipped in with a bid of £65, despite the seller's remarks about it having woodworm. this model under the name Indian Spinner, made between 1980-86, confirmed by the original assembly instructions. I used those instructions to take it apart and put it back together after applying three coats of Danish Oil, poured oil on all the moving parts and bought a new 10mm nut to replace the only missing bit. How smart it looked! I named it 'Twice Shy' (as in once bitten) and tied a leader onto the bobbin, ready to present to BG with a great Ta Da!! Small snag - I couldn't see how to get this wheel to spin yarn. I thought I must have reassembled it all wrong, because the mechanism baffled me. The one huge bobbin has a whorl fixed to its back and the weight of the big wheel itself actually hangs off that via the drive band. Unlike my scotch tension Ashford Traveller, the flyer has no evident link to the turning of the wheel, just a brake band running over the orifice. Though BG had to wait til spinning camp in March to have a confident tutor, this wheel did prove entirely functional, just treadle away and you soon get the hang of it. By Easter, she had spun a dozen balls of superbulky yarn and developed thighs like nut crackers. BG fed massive amounts of fleece into its gaping orifice and as I imagined, did love making wild, thick yarn, though apart from pure capacity, the Indian still seemed to me a rather daft wheel design. Not only is it heavy to treadle, there is only the one bobbin. Unless you know how to make single yarn (which I don't), a spun single has to be wound back off the bobbin and rolled into a ball, before you spin the second single. Then the second single has to be wound off and balled, before you can finally ply the two singles together and finish your yarn. It was only recently that it occurred to me to ask to borrow it, specially for a heavy weight plying job. Resolving to catalogue, organise and use up my stash of wool, I have so far only got as far as the very first fleece I ever spun. The Huxtable Jumper has not had much wear, being heavy, hot and well, the post-apocalyptic look is so dystopian. Once unravelled, I found the yarn was soft and weak with incredibly loose plying, which rather explained why the fibres were already pilling. bag in hibernation. This yarn was a fascinating and thoughtful gift, a huge egg of tough, highly energetic Z twist single Karakul sheep wool, brought back for me from Samarkand. Maybe it was intended for warping a rug. Crocheting with it proved so hard on the hands, the original project got abandoned. get up enough power to shift the weight of a full bobbin. Close inspection showed the final yarn was around 5-6 wpi. The weight was shocking - 10m weighed 22g. No wonder that was hard work. Still, I now have a high grist yarn which ought to combine durability with all the colours I so admired in my first Jacob X Texel fleece. The latter has also added enough softness to crochet without taking the skin off my knuckles. To find for Bold Sir Gordon, the perfect chain mail vest. Sustained by cups of coffee and perhaps, a cigarette. The very thing in which to dress her dear, historic man. Fran, a fibre freak, well versed in curious knitwear. Her ten millimetre needles positively flew. It knitted up in no time into chain mail of great beauty. A mediaevel birthday gift with good wishes warm and hearty. Sir Gordon led the dancing, magnificent in wool.